We've all been there before - reaching for a box of crackers or a bag of chips during the afternoon to tide yourself over until dinner. Before you know it, half of the box of crackers might be gone and you still aren't satisfied. It's easy to plow through a box of crackers in just 1-2 sittings, because most of them don't have the proper balance of macronutrients. You know what though? The same thing applies when you eat fruits or vegetables solo for snacks too. The satiety factor just isn't there if you don't pair your carbohydrates with fat and protein (or at minimum, one or the other). Eating properly balanced meals and snacks throughout the day is a great way to minimize spikes in blood sugar (and subsequently insulin) and eliminate "hanger" and the mood changes that go along with it, if you know what I mean. Below I'm going to list 5 snacks I've been all about lately to curb hunger and cravings and still satisfy your sweet tooth if you've got one. Plain celery just isn’t going to cut it for most people from a taste or satiety standpoint. While this kind of reminds me of eating “ants on a log” with raisins and peanut butter in Kindergarten, there is something addicting and satisfying about throwing a few dark chocolate chips onto your celery and nut butter log. Sprinkle with a bit of sea salt to up the flavor intensity even more. 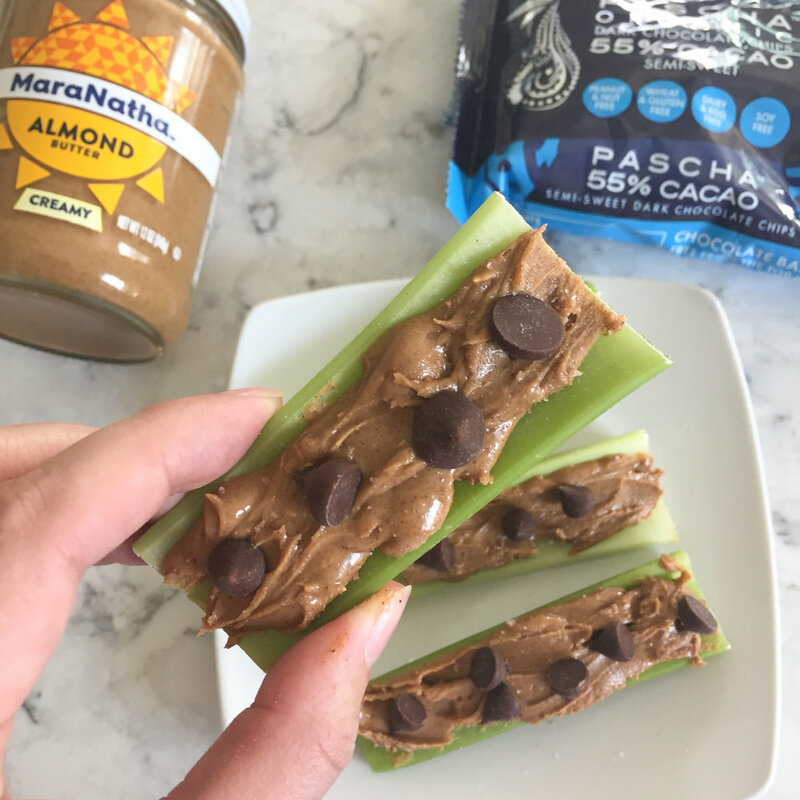 The fat and protein from the nut butter makes this snack quite satisfying and the bit of carbs from a few chocolate chips isn’t enough to cause any major blood sugar imbalances for most. This is one of my all time favorite snacks. 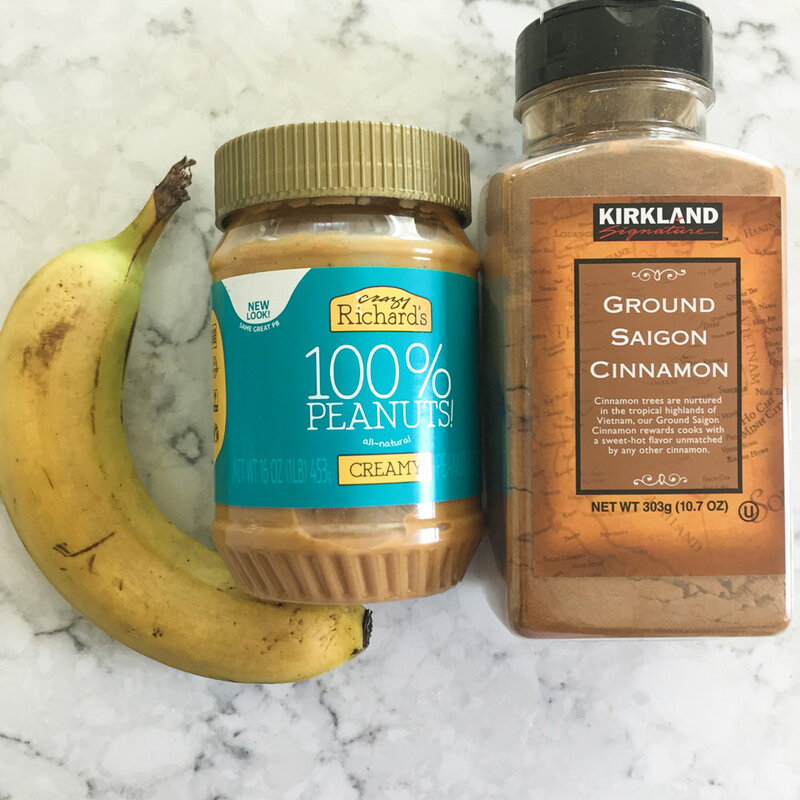 Spread some natural peanut butter over banana slices and sprinkle with cinnamon if desired. This is SO much more satisfying than just eating the banana by itself. Always listen to your body, but many people are satisfied with 1/2 of a large banana or 1 small banana when you add on the fat and protein from the nut butter. If you use only 1/2 of the banana, save the other half to throw into the freezer for a smoothie on a later date. 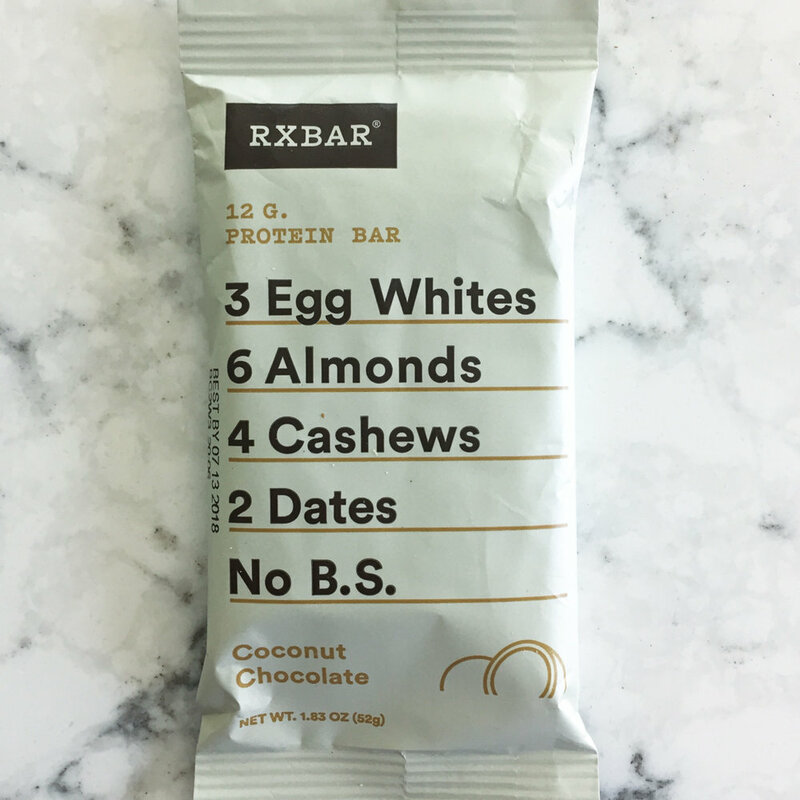 This also could make a great travel snack if you buy portable nut butter packets. I’ve tried many bars, and these are one of the only ones that actually keep me full for at least 3 hours or so. Fair warning, some people take issue with the super chewy texture and you might have to look in the mirror to check your teeth before engaging in a conversation with anyone after eating one. Other than that, I actually love the taste of these, but I know they are hit or miss for some people. Instead of eating a bowl of cereal, try eating a bowl of raw nuts with some berries (which are low glycemic index compared to many other fruits) and a few chocolate chips if desired. Pour milk of choice (plant-based or dairy) on top. My favorite combo is blanched almonds with blueberries, strawberries, a few chocolate chips, cinnamon, and sometimes a drizzle of natural peanut butter on top too. Eat with a spoon like cereal. If you tolerate dairy, Siggis yogurt should totally become your new jam. The macro content is hard to beat from a balance standpoint and you also get gut-healthy probiotics from it. Go for the 2% or full-fat variety because it will be more satisfying than eating low-fat yogurt. Optional toppings include slivered almonds or berries if you want to jazz it up a bit. That’s some awesome macronutrient balance there with the 10 g carbohydrate, 9 G protein, and 10 g fat. There you have it! Comment below if you try any of these or if you have a favorite balanced snack idea you’d like to share! If you like these ideas and want more, you can download my Free 2-3 Macro Snack handout by subscribing to my email list on my home page. Until a couple of years ago, I never understood what the podcast hype was about. My husband has listened to podcasts from the beginning (mostly fantasy sports) and always tried to get me into it, but I resisted for a while, thinking “what could be so great about a podcast?”. Little did I know, there are MANY more options for shows outside of the sports realm, and here I’m going to list some reasons to listen to podcasts as well as some of my favorite health, nutrition, entertainment, and educational podcasts. 1) Time management/optimization – One thing I think I hear everyone say is “there just isn’t enough time in the day”. Instead of listening to nothing or listening to the radio (which you probably can’t stand the music playing if you are over 25), listen to a podcast on your commute instead. It also makes working out and cleaning/cooking more tolerable when you have some entertainment in your earbuds. I tend to listen to more entertaining podcasts when I am doing things like cooking (since I am concentrating on more than one thing) and more educational ones when I am able to give my 100% attention. 2) Continuing education – I’m all about continuing ed these days. I’ve found the quote by Einstein, "The more I learn, the more I realize how much I don't know”, to be very true these days. There are some great educational podcasts and it would be a shame not to take advantage of them. Want to learn more about nutrition? Great! Functional medicine? Got that covered. Motivation or random facts? Yep, there’s a podcast for that too. Sometimes at the end of the day our brains are just too tired to read, but listening to a podcast can be mindless yet enjoyable and educational. 3) Depth of content – You are going to get a lot more detailed content listening to a podcast vs. a radio show. 4) No commercials – Sure at the beginning some podcasts do little shout outs to their sponsors sometimes, but it is wonderful not having your content interrupted by commercials. 5) They are free – Which is actually kind of crazy. Considering the depth of content some of these podcasts provide, it’s kind of mind-blowing that you don’t have to pay to listen. 1) Natural MD Radio with Aviva Romm: Dr. Romm is a Yale trained physician who is pretty much the queen of women’s natural health and I’m totally fangirling over her podcast these days. I discovered her podcast when looking to learn more about thyroid issues and her episode 06:” What Thyroid Labs Should You Ask For?” does an awesome job breaking down the basics. She has episodes on almost anything you can think of including gut health, detox, PCOS, adrenal health/adaptogens, reducing menstrual pain, and so on. Seriously, check this podcast out! 2) Real Food Radio – This podcast is hosted by Ayla Withee and Nicole Holovach, both Registered Dietitians who take an integrative and functional approach. They do an awesome job breaking down complicated topics into easy to understand and applicable material that won’t be seen as “too out there” even from those who primarily practice conventional nutrition. Podcast topics include nourishing your fertility, stress, supporting your microbiome, and cholesterol myths. I have listened almost all of them and they totally rock. 3) Sustainable Dish – This podcast is hosted by Diana Rodgers, RD and is focused on all things food, nutrition, and sustainability. She features many guests on her show from farmers and activists to sleep experts. 4) Fertility Friday Radio – This podcast isn’t just for people who are trying to get pregnant, but for those who want to learn about all things fertility, including period problems and natural fertility tracking and awareness. Host Lisa releases new episodes each Friday and usually interviews a new guest each week. Topics range from thyroid health & fertility, naturally avoiding pregnancy, a dive into the effectiveness of fertility drugs, to the importance of eating good fats and not under-eating to nourish your fertility. Check it out ladies, I know you will learn something! 5) The Dr. Taz Radio show – The Dr. Taz Show is a mix of conventional and functional medicine with a bit of Ayurveyda, herbs, and nutrition mixed in. Episode topics range from reversing Chrohns disease to why having a miracle mindset matters. I’ve found this podcast to be quite enjoyable and entertaining. 6) New Frontiers in Functional Medicine – Dr. Kara Fitzgerald is a Naturopathic Doctor who practices functional medicine and interviews the best minds in functional medicine each month on her podcast. The materials presented in her podcasts are quite technical and I would recommend this show more for healthcare professionals and people looking to get more in-depth knowledge around functional medicine. 7) The Tim Ferriss Show – Tim interviews world class performers from all sorts of fields and asks them about their routines, stories, and challenges. It’s an awesome podcast for learning and self-improvement. He’s also a best-selling author and just released a new book called “Tribe of Mentors” which I plan to read as soon as my husband finishes it. 8) Freakonomics Radio - I couldn’t figure out how to put this podcast into words, so here is the quote directly from their site: “this podcast explores the riddles of everyday life and the weird wrinkles of human nature — from cheating and crime to parenting and sports”. Hosts Stephen J. Duber interviews Nobel laureates and provocateurs, social scientists and entrepreneurs. They recently had an interesting episode where they interviewed Dr. Alessio Fassano, who is world-renowned expert on Celiac Disease and Gluten-Sensitivity and has also pioneered research on intestinal permeability and autoimmune disease. Dubner and his co-author, Steven Levitt, have also written several books that are worth reading that you can find on their Freakonomics website. I’m sure there are hundreds more amazing podcasts I could have listed here, but there are only so many hours in the day right now. I hope you check out and enjoy some of these shows! If you do, let me know what you think below! Have another podcast you think I should check out? I’d love to hear about it! Happy listening! Virtual dietitian and nutritionist based in Michigan. Helping clients examine eating and lifestyle habits to find foods and behaviors that make them thrive. Shoot me an email by filling out this form!